Testing Of 5G Wi-Fi Troubles Cows. Should We Be Concerned Too? 5 Dutch dairy farmers in Stitswerd, Groningen, witnessed a mystery on Saturday, January 28. Several hundreds of cows from the 5 dairy farmers simultaneously started running riot without a clear cause. The cows bumped into each other and the fences of their cowshed. One of the farmers said that their behavior really looked like agony, so it was not just a moment of frustration for the cows, it was really a life or death situation. Even more shocking is that the farmers all have experienced these panic attacks from their cows several times before, for the lasts few months. However, these kinds of mysterious events only seem to occur around the small town called Stitswerd. It was speculated that a raptor bird might have caused the panic attack, however, this can’t be true since it happened at 5 dairy farms simultaneously. A veterinarian has been consulted as well, but she couldn’t find an explanation either. Another possibility is that an earthquake scared the cows, but none of the farmers felt anything themselves. Besides, cows in Groningen should be used to earthquakes due to the regular gas drilling in the province (which is progressively destructive to the land and houses of Groningen by the way, damn fossil fuels!). The most logical conclusion is that the panic attacks are caused by the recent testing of 5G Wi-Fi in the North of Groningen, exactly were Stitswerd is located! Groningen is the first flat land region where they are testing 5G. Other places are Finland and South-Korea, but there they are testing in urban regions. 5G is being tested on urban and flat land because on flat land there are no obstacles to influence the network signals. Additionally, 5G can be used for self-driving agricultural machinery and to moderate the farming soil and such. Mystery : What’s the matter with cows in Stitswerd? What do the cows of Stitswerd do? Milk farmers in Stitswerd have been struggling with a lot of puzzles lately: their cows regularly panic, run into death anxiety through the stable and are almost unable to calm down. The strange thing is that this occurs not only in Oudman’s business but also in four or five other companies in the area. At the same time there are also panic on those farms. 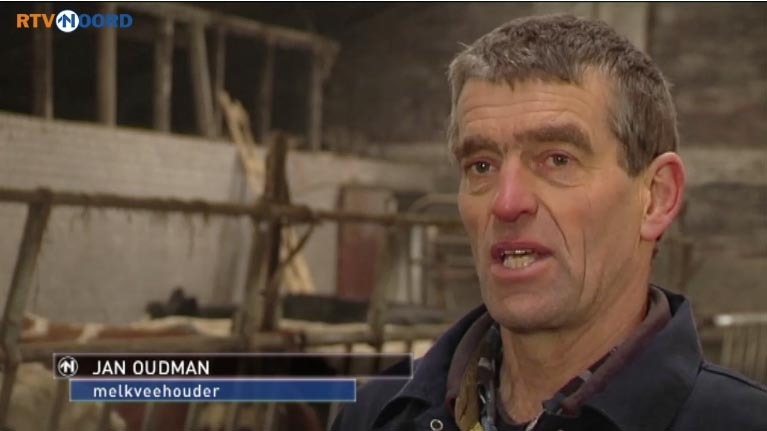 For example, by farmer Piet van den Berg, the neighbor of Oudman. “They almost break the tent here,” he summarizes the unrest. The farmers in Stitswerd have no idea what causes the panic attacks, which occur around three to four times a month. Also, the vet who consulted them does not know. It is more common for cows to be restless, but according to the vet, on this scale and at the same time, several farms are very strange. “They’re stuck in the sky, it’s like it’s coming from there. I do not think it’s coming through earthquakes, because they’re already used to it, “says Oudman.If the problem also occurs with dairy farmers in other parts of the province, he would like to contact these farmers. 5 dairy farmers in Stitswerd in Groningen stand up for a riddle. On Saturday, panic broke out with their cows, where it happened earlier in the fall. 170 dairy cows from Adriaan den Dikken from Stitsweard started running back and forth on Saturday after milking. They walked around like crazy and looked nowhere. She even bumped into the feeding fence and against the boxing fence. Den Dikke has already experienced this before, feeding is no longer helpful. The fear of the cows and bigger than the incentive to eat. After even a veterinarian has arrived, the cause has not yet been found. They also thought of a bird of prey, but that is not the case either. The cows of the 5 dairy farms all ran at the same time. It really can not be that a bird of prey is hanging over the cows at the same time. After some searching I came across the following message on Facebook. If the cows are running out of this, what will it do with our bodies? Will you help spread this message by sharing it? Time that more people know this. Farmers in North Groningen are puzzled. They regularly see acute and severe panic attacks among their dairy cattle. The cows then run through the stable in complete mortal fear. The Oudman family from Stitswerd is now looking for publicity. “We would like to know what is going on,” says Hilma Oudman. Her husband Jan can not get on the phone, who is in the yard to speak to reporters. RTV Noord has already been there and now there are teams from BNR and NPO3, says Hilma. It is therefore a special phenomenon: complete couples of cows that panic from one moment to the next and run through the stable like flies, fly on top of each other and go down. This has happened at least three times since October, according to the farmer’s wife. The last time was on Saturday morning, shortly after seven. Cows are herd animals, and the fear of one cow can easily spread to the rest in a couple.But that explanation is not logical either, since anxiety attacks occur at several dairy farms at the same time. The first time it happened was on an evening in October last year. Most cows were already in the barn, but they still had free access to the pasture. “They all ran out in a panic all at once, and they did not dare to go inside all night”, says Hilma. This entry was posted on September 4, 2017, 11:52 am and is filed under 5G Antenna, animal, antenna, anxiety, cell tower, Cows, Europe, health and safety, Netherlands, wifi, wireless devices. You can follow any responses to this entry through RSS 2.0. You can leave a response, or trackback from your own site.